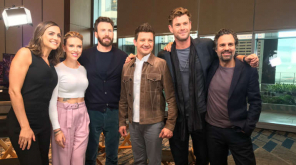 With less than three weeks leading up to the theatrical release of the movie "Avengers EndGames , promotional tours by performers are taking place throughout the United States. The 11-year-old Marvel Cinematic Universe's endgame is the members of the original Avengers, led by Robert Downey Jr. In the performer's Instagram, we can see the appearances of the event in a merry manner. The stars of Marvel Studios’ #AvengersEndgame assembled at Disney California Adventure Park today for Avengers #UniverseUnites!